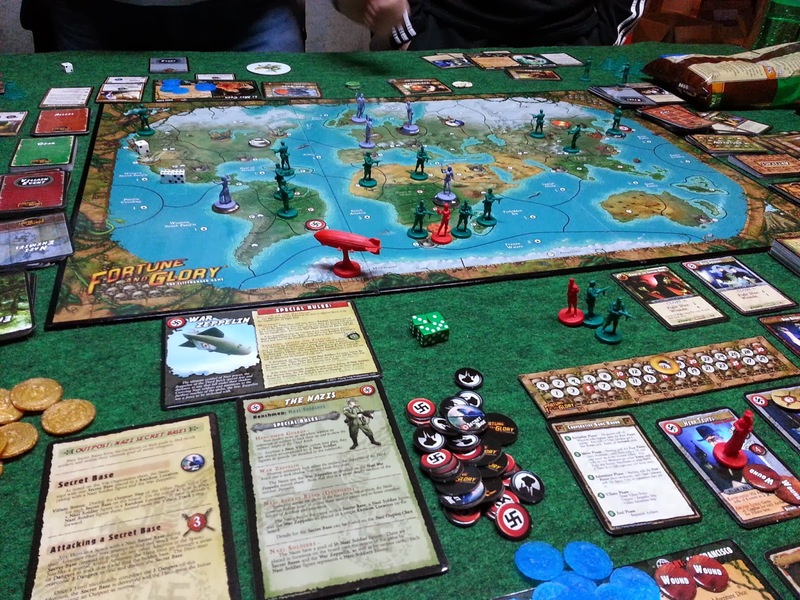 Thursday's game offering was a board game the group has played before, but only in a competitive format. Fortune and Glory (F&G), by Flying Frog Productions, is highly regarded by my group. Set in the 1930's, F&G is very thematic and is reminiscent of Indiana Jones, the Mummy, Tales of the Gold Monkey and a host of other pulp adventure films and TV shows. Without getting into too much detail, the competitive game basically pits adventurers against each other as they vie to collect artifacts from around the world and earn enough fortune to win. Random events happen at locations that can either impede or assist the adventurers and make the game a blast to play. 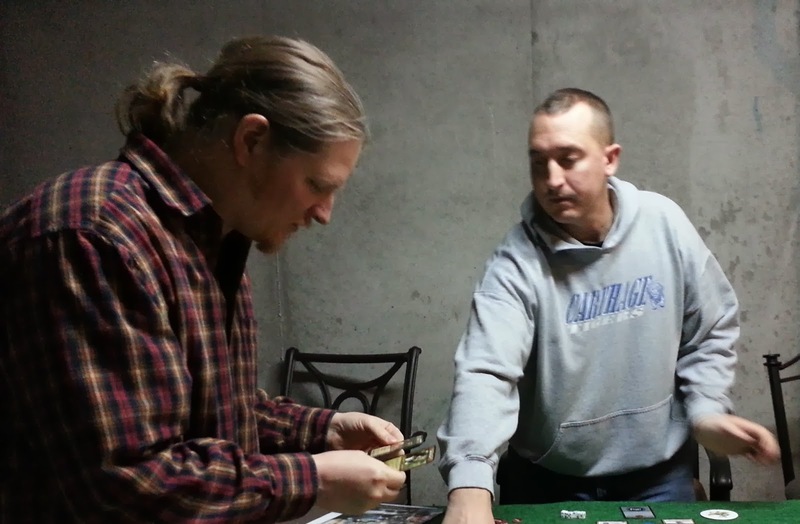 Thursday's game, however, was the first time we've played F&G cooperatively. The adventurers went against the Nazis (you can also choose to play against Mobsters), trying to stop them from collecting the artifacts for their own nefarious schemes. We also added in all the advanced rules: Temples, villains, air flight between locations and using artifact card text and symbols to further heighten the experience. ...and Bill and Dave (the guy glaring at me with his hand in the bag). Note: The beauty of being the blogger is that my mug isn't in a picture! Ha! We started the game learning the new rules and knocking the rust off remembering the old ones. The cooperative game plays very similarly to the competitive version, so it did not take us long to get into the game proper. It's fortunate for us that F&G is a relatively easy game to play. There are a ton of bits (tokens, cards, etc), but their application is sensible and not bothersome. In essence, the adventurers needed to earn 45 fortune points before the Nazis earned 20. That's a pretty big disparity of numbers, but the adventurers have a lot more they can do in a turn than the Nazis. We progressed uneventfully through the game, with only cruddy dice rolls on my part to blame for an entirely untouched temple collapsing almost immediately upon my character's arrival. Yay, that. One other thing to note is that we drew a card that increased our fortune goal to 47 instead of 45. I tried my hand at sabotage and took out the Nazi zeppelin for a round and then proceeded to destroy a secret Nazi base (in Germany, no less). Really, the things you can do in this game are fantastic and keep every player involved, which is a must for a cooperative game. With all that in mind, late in the game we were at 39 fortune while the Nazis were at 11. Then the 'bad' turn happened. 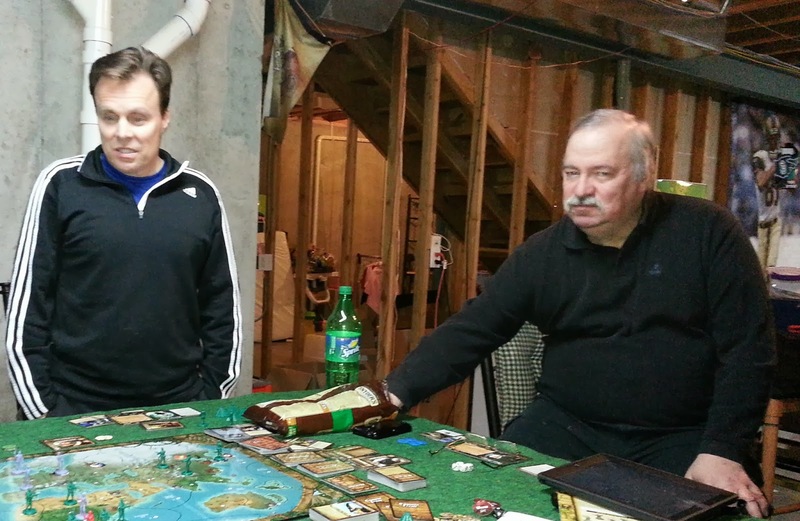 Two villains were able to capture artifacts, immediately bumping them perilously close to their goal. On my turn, I was able to knock them back a few points, keeping them 'honest'. We knew we could win on the next turn, as several of us were in positions to cash in artifacts and launch us past 47. It all hinged on the die roll of one villain during the 'villain phase'. As you can see in the picture, the Nazis were in South Africa, ready to take an artifact. The Nazis had expanded across the globe, spreading their Fascist message to the world. The track on the right of the photo counts the Nazi's points. At this point in the game, they only needed four points to win. Easily attainable with one artifact! All our hard work wasn't enough...the Nazis won! All in all, a fun (and long) night. I liked the advanced rules. They added more flavor and options to the game, but didn't disrupt the 'flow' or overbalance anything. I think a couple more plays are in order...after all, we can't let the Nazis win! Thanks to all the attendees for a fun night of gaming and camaraderie.